Rebekah’s Closet is a mission outreach to young families in the area seeking support providing for their infants and toddlers. Each Thursday from 10 am until 2 pm, parents can come to the door of the church at 300 Appleton Street, ring the bell, and be welcomed into “the closet”. There they can receive diapers, wipes, clothing, toys, books and furniture as they become available. A parent in need may come once a month with a letter from a social service agency. There is no charge. The people of the United Congregational Church support this ministry through monthly special offerings and gifts, but the heavy lifting is done by volunteer director Paula Thouin with help from Jay Boulet and several other loyal helpers. Other churches, organizations and individuals have made generous donation to the mission. 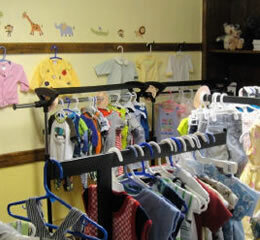 Thank you all who bring their heart and lend a hand to Rebekah’s Closet!